Reason for Reading: Next book in the series/Bess Crawford Read-along. World War I nurse Bess Crawford, introduced in "A Duty to the Dead," returns in an exciting new mystery in which a murder leads her into the clutches of awily killer. Today I am posting my answers to the questions asked about the second book in the Bess Crawford series. Tune in on May 29 (or thereabouts) to see my thoughts on book 3. 1) As in A Duty to the Dead, long-seated familial animosities and jealousies play a role in the crimes committed. What did you think of the Garrison and Melton families? How do they compare to Bess' family, or to the families of soldiers and nurses created by war? This book just seemed like drama, drama, drama. That is not necessarily a bad thing, it kept things interesting, but it seemed like everyone was having some sort of a problem in this book. I find that sometimes Bess and her family are shown as just a bit too perfect. They always seem to get along and Bess is always on a quest to do the right thing. There doesn't seem to be enough flaws to round out the characters. I think that is why despite enjoying the series, I am still a bit leery of Bess. It is something I have been trying to put my finger on since I read the first book. It could also be because the other people in the book are so flawed it makes for almost a black and white comparison. And, when everything comes out in the end you can't help thinking 'Seriously?'. It is amazing how people can act, I tell you. The Garrison and Melton families were interesting, but it seemed like everyone was a bit crazy. There were some sympathetic moments, but it is sad that things played out the way that they did. 2) Simon Brandon plays a far greater role in this novel than he did in A Duty to the Dead. What do you make of that and do you think his intentions stem from his duty to Bess' father, or from his affections for Bess herself? I am so glad you asked this question because I have been thinking a lot about Simon Brandon. I think he is going to continue to become more and more of a central character. And, I think it is clear from some of the scenes that it has more to do with his affection for Bess than loyalty to her father. I think this is one of the interesting things about this book because I am curious how the authors will choose to play it out. 3) Simon strives to curtail the risks that Bess takes throughout the novel. This advice of his struck me particularly: "We have to move on. Put the living first. There are already enough monuments to the dead." Do you think Bess's drive to right the wrongs she sees puts her at odds with this advice, to her detriment? That was an interesting piece of advice and I suppose it makes sense, but I can also see where Bess is coming from. The police are getting no where with the case and she feels like since she was one of the last people who saw the victim alive, it was her responsibility to make sure her story was told. If she was a victim of a war than yes, there would be lots of monuments. She died senselessly, though, and she needed someone on her side. Sometimes Bess might go a bit too far, and it does seem like to her detriment, but ultimately it all plays out in the end and I think that redeems everything. 4) Do you think there is any such thing as an "impartial witness?" Bess admits to adding her own perspective and interpretation to what she sees at the railway station. Later, Mrs. Hennessey is referred to by Bess as an "impartial witness," presumably because she's completely in the dark about what's been happening. But what do you think of the phrase, and what do you think the authors mean us to to think of it? 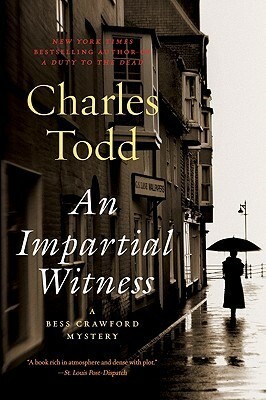 I don't think there is such thing as an impartial witness. No matter what happens, you are going to put your life experiences and opinions into play when addressing a situation. I think it just happens no matter how hard you try. The authors, though, it is hard to say what they were thinking. I think it is likely they were trying to show there is really no such thing as someone that is impartial, but that could just be my opinions clouding things. 5) What did you think of the ending of the novel? Were you expecting a confrontation, or confession, that you didn't see? And if so, why do you think it was written that way? Well, firstly, I solved the mystery in this one. I had this feeling and I was happy to see that I was right come the end of the book. There were a few moments where I doubted myself, but ultimately I thought I had the right guy. Secondly, I thought the book played out well in the end. I wasn't really disappointed by the ending. It was just the best way to finish everything up. 6) Did you learn any new phrases while reading An Impartial Witness? For me it was "Well, it's shank's mare, then," which Sister Benning says to Bess when they have to walk behind the ambulance of wounded soldiers on their way to safer ground. Turns out that "shanks mare" is an Irish phrase referring to having to hoof it on your own two legs. I had the same one. I had no idea what 'shanks mare' meant. It was the first I had ever saw it used in a book, so I had to look it up. It's a rather entertaining phrase! 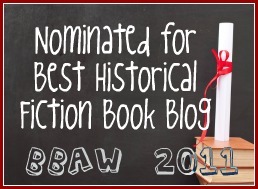 This book counts for both the War Through the Generations Challenge and The Historical Fiction Challenge. This review was cross-posted at The Written World.